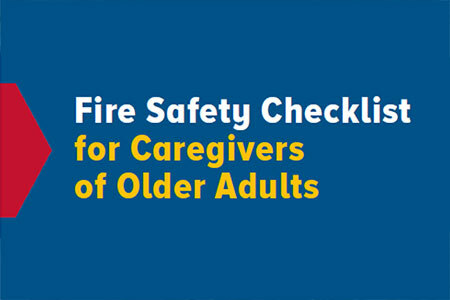 Older adults are more likely to die in home fires because they may move slower or have trouble hearing the smoke alarm. Make sure the people you know are prepared and safe. Smoke alarms are on every level of the home. Smoke alarms are inside and outside sleeping areas. Smoke alarms are tested each month. Smoke alarm batteries are changed as needed. People can hear smoke alarms from any room. Can everyone hear the alarm? If not, consider another type of smoke alarm – like one that has a different sound or one that comes with a bed shaker or strobe light. The cooking area has no items that can burn. People stay in the kitchen when they are frying, grilling, boiling, or broiling food. People only smoke outside and never in bed. People put cigarettes out safely in an ashtray with a wide base that will not tip over. People never smoke around medical oxygen. Space heaters are least 3 feet away from anything that can burn. People blow out candles before leaving the room. There is a fire escape plan that shows 2 ways out of every room. Exits are always clear and not blocked with furniture or other items. Everyone knows where the safe meeting place is outside the home. The escape plan works for everyone, including people who use a wheelchair, a hearing aid, or glasses. There is a phone near the bed to call a local emergency number in case of a fire. Make sure people who use a wheelchair or a cane can get to them and get out quickly. Tell them to keep glasses or hearing aids next to the bed. Carbon monoxide alarms are less than 7 years old. No electrical cords run under rugs. All electrical cords are in good condition and not broken or cut. People clean the dryer of lint after every use.